You can certainly make some guesses about your health based on what you see in the mirror. And the daily feedback your body gives you is, indeed, a helpful status indicator. But nothing compares to plotting the course of your wellbeing using the numbers of your personal chemistry. I have chosen to share my health information with you in the hope that you will become proactive about your future. You, however, must react to your own unique set of circumstances. For the past thirty years, the measurements included in this basic battery of tests have been my guide posts. Let’s take a look at them, and I’ll share with you my personal decisions regarding recommendations given to me over the years. Never have I been prescribed medication to treat a chronic condition, although I have been advised in the past to consider it with regard to blood pressure and cholesterol. Being prescription free and healthy at 65 puts me in the company of a very small minority. By way of background, my father and mother were both on medication for blood pressure and cholesterol. In spite of strict dieting and being an avid and dedicated swimmer, Mom had continued cholesterol problems even while on medication. My father had a quadruple bypass in his fifties and a second heart surgery before he died in his seventies. The genetic deck was stacked against me regarding the most troublesome health issues of the day. The expectation, as a young man, was that these same cholesterol and blood pressure problems would be mine by way of inherited tendencies. Serious research done while in college ingrained in me a respect for the power of pharmaceuticals–both the benefits, and the inevitable side effects. My approach to good health became the pursuit of what the body could do best on its own first–fortified with the benefits of exercise, nutrition, recuperation, and a calm spirit. Cholesterol levels above 200 typically raised concern on the part of my doctors, with drug recommendations following. I was advised years ago, with my level at 230, to be on medication. I chose to continue doing what I was doing and felt comfortable with my situation. Data have been available for years regarding the numerous controversies surrounding these drugs, and I made my choices accordingly, keeping my opinions to myself. 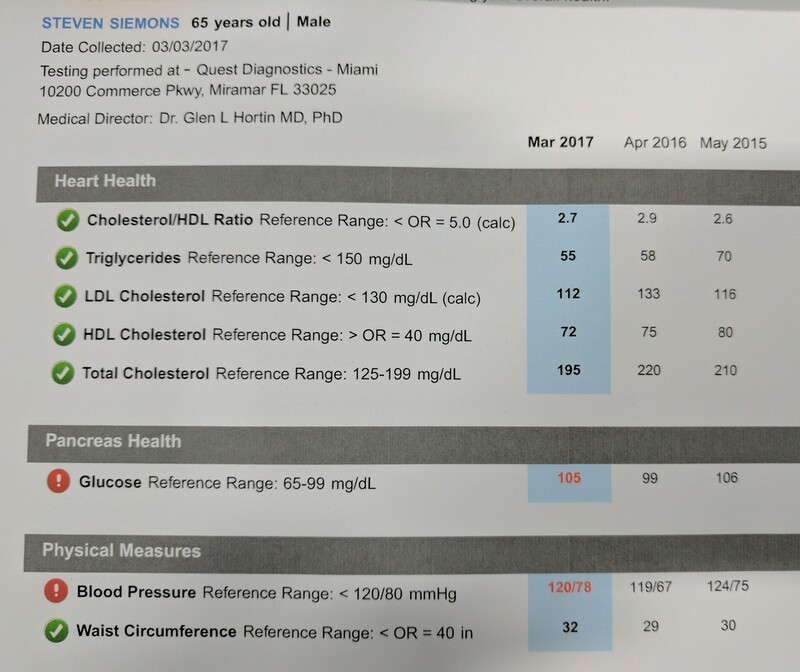 In later years, under a different primary care physician, I was advised that the concern over cholesterol at a 220-230 level was mitigated by the HDL/LDL ratio and my commitment to a healthy lifestyle. Finally, a doctor who felt the way I did about my wellbeing. For many years, BP hovered in the 130/85 range – – sometimes a little more, sometimes a little less. When advised to bring the numbers down with drugs, I kept on course without them. The goal was to remain heart healthy without drugs beyond the age at which my father had his first quadruple bypass. This has been the biggest surprise to me. You can readily see that it is borderline healthy. Even though I pay close attention to sugar and carbohydrate intake, the numbers are revealing. My first takeaway was, “What would it be if I wasn’t so careful?” By all outward appearances–my weight, BMI, exercise level, food consumption –you’d think that blood glucose levels would be toward the lower limits. Looking in the mirror would make me think that there’s no hint of a reason to be concerned. In this case, however, the mirror is blatantly misleading. The decisions you make about your health are the most personal and important that you will make. I am not recommending that you make the decisions that I made, but that you make the best decisions for yourself, armed with the best information you can have, and understanding your own commitment to a healthy lifestyle. Making decisions based on a few pieces of the puzzle can lead you in the wrong direction. I had always thought, based on my total profile, that taking drugs for either my cholesterol or blood pressure would have created issues with side effects more devastating than the slightly elevated risk posed by being at the edge of normal. There is no doubt whatsoever that America’s treatment of choice for practically all ailments is some sort of pharmaceutical. We can’t blame this situation on the industry, as much as we’d like to. You must take responsibility for your own health–each and every day with the lifestyle decisions that you make. The journey of good health is not an easy one. Along the way, if you’ll make the effort to incorporate more healthy responses and less dependence on others making your decisions, you will be glad you did. The Senior Health and Fitness Blog by Steven Siemons is licensed under a Creative Commons Attribution-NonCommercial-NoDerivatives 4.0 International License.